Ibrox Noise: Mystery over key position deepens; method behind SG's madness? Mystery over key position deepens; method behind SG's madness? Mystery surrounds Steven Gerrard’s goalkeeper intentions after the signing of Andy Firth confused the plan for the men at the back. NZ international Stefan Marinovic arrived at Auchenhowie earlier this week for a seven-day trial and hopes to win a deal to become the new number two, but the signing of Firth has certain created a bit of a spanner of the works and suggested the Kiwi had failed to impress. But his continuing trial means he is still endeavouring to win a deal despite the capture of the 22-year old from Barrow. The further curiosity is of course Robby McCrorie’s loan out – the previous number joint number two with Wes Foderingham may find it a little frustrating to have had to leave Rangers on loan only to be replaced by a former youth charge of the manager. In short, would keeping our own not have been a better move? And then to add even more subplots, Foderingham’s future remains up in the air too – it had been posited he was seeking a move out, but no movement yet has materialised on a possible loan or permanent exit so he remains at the Hummel Training Centre. 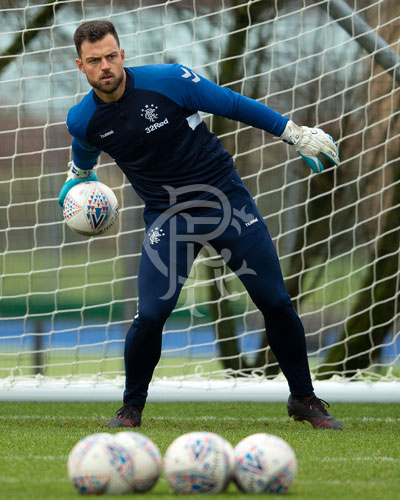 It all adds up to a curious place – if Marinovic wins a deal Rangers have four senior goalkeepers which makes absolutely no sense, and we must raise an eyebrow at it. We’ve heard it reasoned that Firth was signed to cover for the Development Squad – but there are a lot of fans who would rather see us train our own players up in that squad and continue to experience match day at Ibrox and away in order to develop for that. Which is rather the point of the Development Squad, no? Either way we wonder exactly what the state of play for our men between the sticks will be come February. I would rather McCrorie was playing for Morton than our Development squad, same as Dallas. On those grounds, we needed a third goalie in. Not sure why we are looking at Firth AND Marinovic unless he intends Fod to leave this window, though. Maybe that is why he is keeping Marinovic hanging, maybe until Feb 1. Agree. Your reasoning is the only one that makes sense. if McCrorie had stayed he could have wasted a whole season not playing very much ,he needed to go out to pay regularly but as Alnwick was already out we needed to keep hm as cover .Is a catch 22 really .Its a good move to get him out playing at the next level for him .Goalkeepers are limited for opportunity as you can`t sit a spare one on the bench and bring him on to get the odd game like you would with an outfield player .We now have 4 goalies out, 3 getting experience and Alnwick , which will give us a better idea of their potential .I must admit though I don`t understand Marinovic still being on trial , just hope Fods doesn`t leave this window.